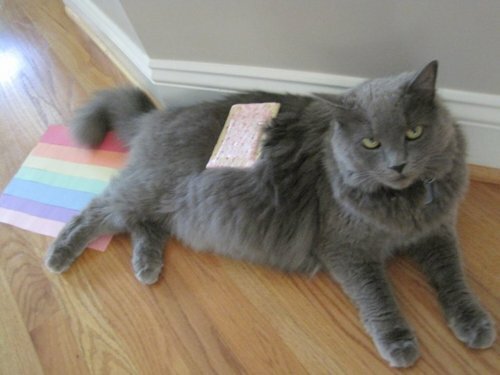 Real life Nyan Cat. Funny gray cat giving the evil eye with poptart on body. Also a trail of arc en ciel fart! :o). Wallpaper and background images in the Nyan Cat club tagged: nyan cat rainbow poptart real life living tac nayn funny. This Nyan Cat photo contains tom, tomcat, and tom tomcat. There might also be chat, chat vrai, vrai chat, chaton, minou, kitty, tabby, reine, and tabby reine.